This landscaping projects page contains some examples of our design, construction and maintenance work. We have chosen a variety of different projects to include in our online portfolio so you can see the breadth of the services we provide. 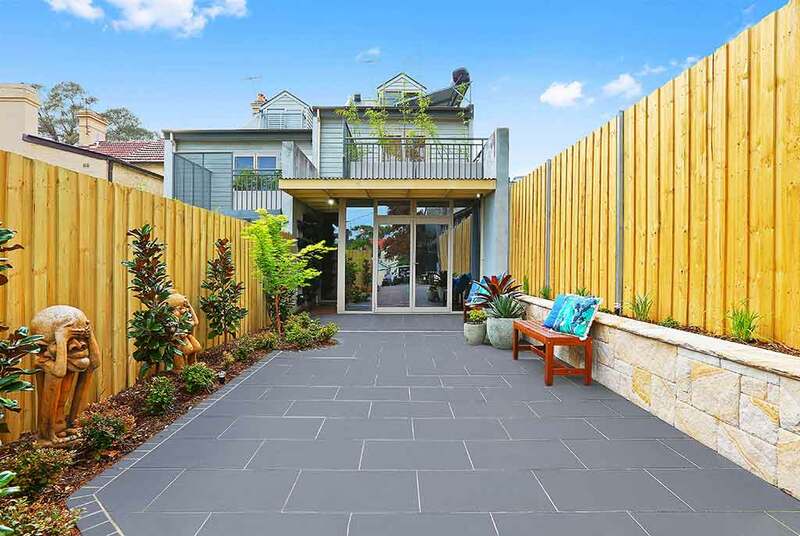 Our professional landscapers have the skills and knowledge to work with numerous materials including sandstone, timber, pavers, tiles, water, electronics for lighting the list is endless. We are skilled at shaping and forming all landscape environments including flat frontyards, sloping backyards, multi-level business areas etc, nothing is too difficult. 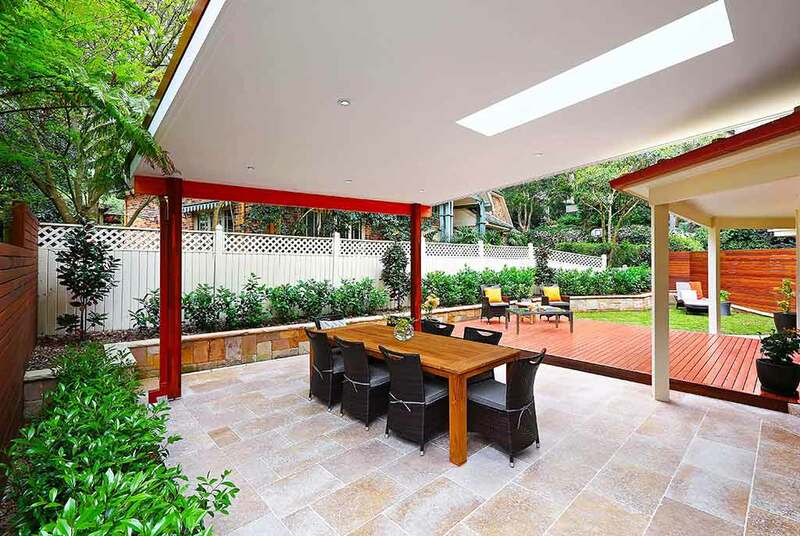 A stunning design and construction example from a customer in Mosman, New South Wales. 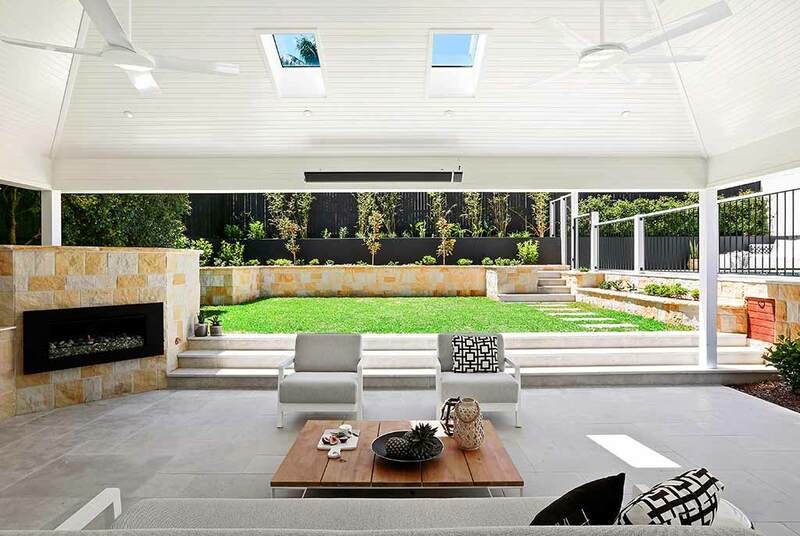 We collaborated with Nicholas Bray Architects as well as Maish Construction to jointly deliver a breathtaking open family entertaining area which includes feature items such as a state of the art pergola (including skylighting), fans, BBQ and outdoor heating. 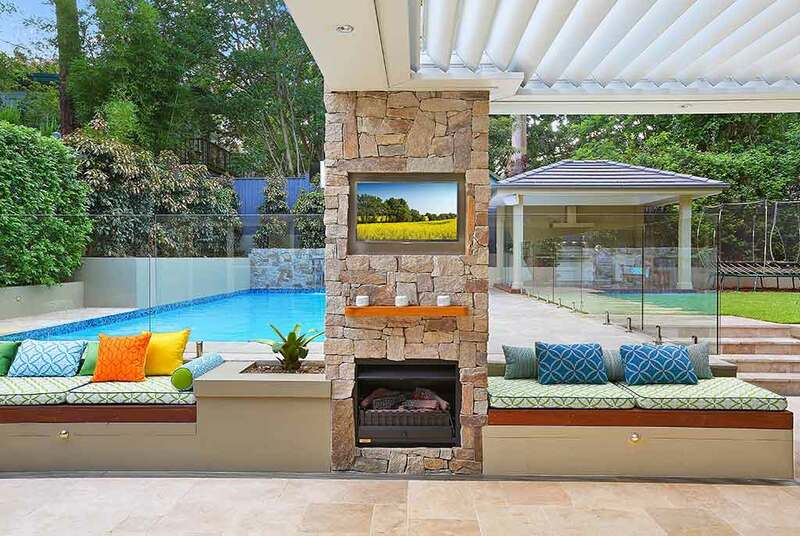 An in-built LED TV for kicking back and enjoying some sport whilst having a beer or two, as well as a built-in outdoor fireplace are just some of the features of this beautiful landscape from Beecroft, New South Wales. We were able to create a perfect entertainment environment that is suitable for use both during the hot Australian summer and the cooler months. An excellent example of how we can turn any tired and drab looking backyard into a modern masterpiece. 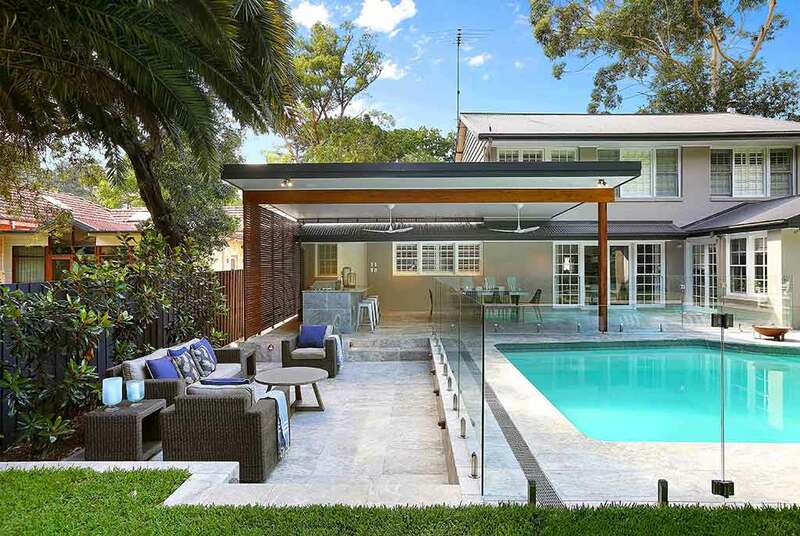 For this Glenhaven New South Wales project we performed a much needed face-lift of the existing inground pool and performed a refresh of the existing backyard, given it a new, open, level feel. 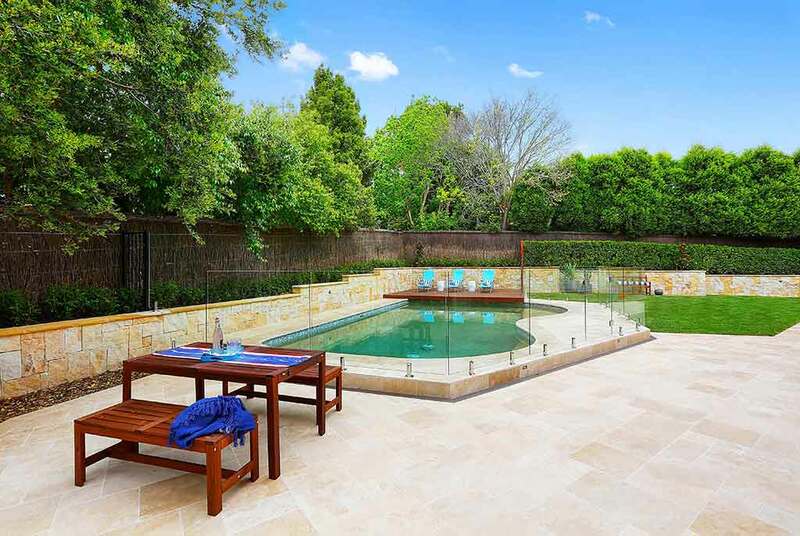 Our brief was to turn this Ryde New South Wales backyard into an outdoor oasis to compliment the newly installed pool. 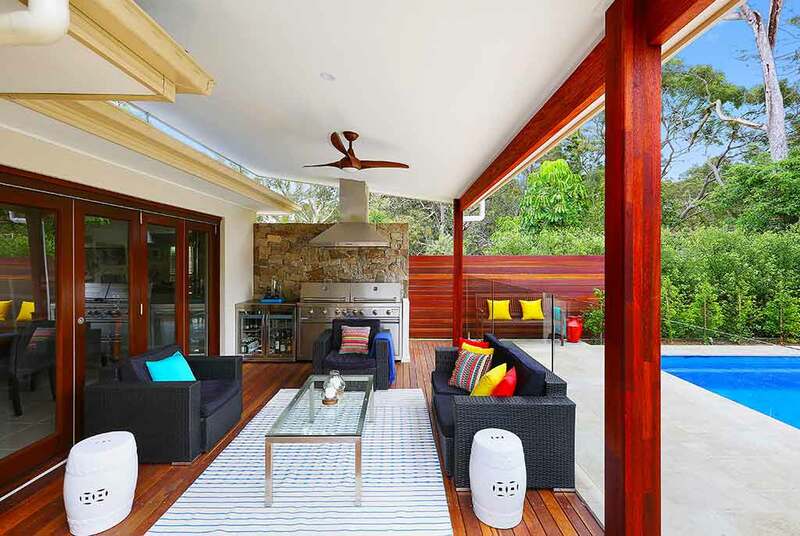 Some of the work we completed on this project includes the installation of garden irrigation, timber screening, laying of a spotted gum timber deck, and cladding on a BBQ feature wall to complete the look. 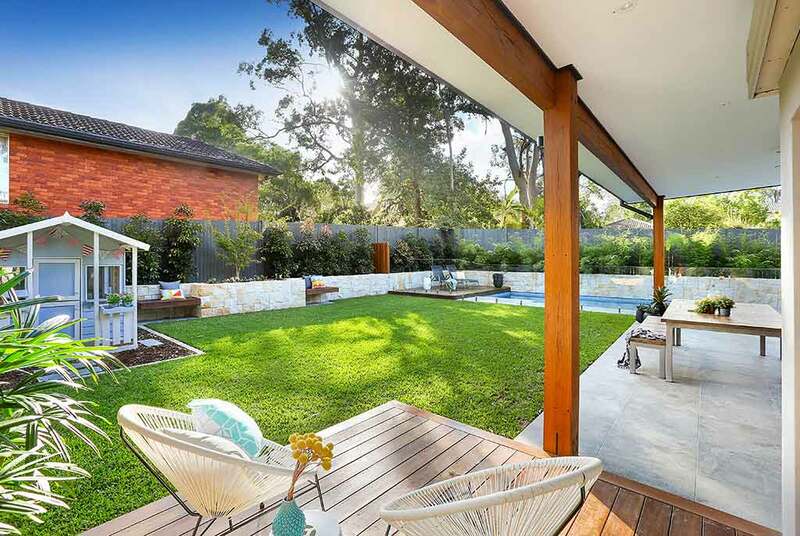 The brief for this project was to turn a dry, rundown, bland outdoor space into a fresh, inviting and practical backyard that could be utilised for entertaining or as a play area for the West Pennant Hills home owners two young children. Browse our photos to see a good example of our ‘before and after’ transformation capabilities. With limited courtyard space, as is common with many Balmain properties, the owners of this beautiful home wanted to create a dual functional area, that is, a space that could be used either as a car park when needed, or as an entertainment space for BBQs, dinner parties etc. A stunning contrast between stone and timber transform this drab backyard into a modern clean outdoor room. Three separate zones were created with features such as dry-stacked sandstone wall, timber screening, skylighting with down lights, spotted timber gum decking and Sir Walter turf to soften the remaining space. For this home in Cheltenham NSW we gave a much needed makeover to a typical retro pebble crete pool. Our client desired a contemporary type look which we achieved through the use of natural materials including hardwood timbers and silver travertine tiles. A great space to kick back and relax with a wine whilst a BBQ cooks up a feast for friends and family. A great example of how we have been able to create a nature, bushland type environment with a rustic garden for this home in the middle of Beecroft NSW. Our clients are enthusiastic gardeners and wanted an area to grow different herbs and vegetables. Large vegie boxes are complimented by recycled railway sleepers and sandstone boulders. 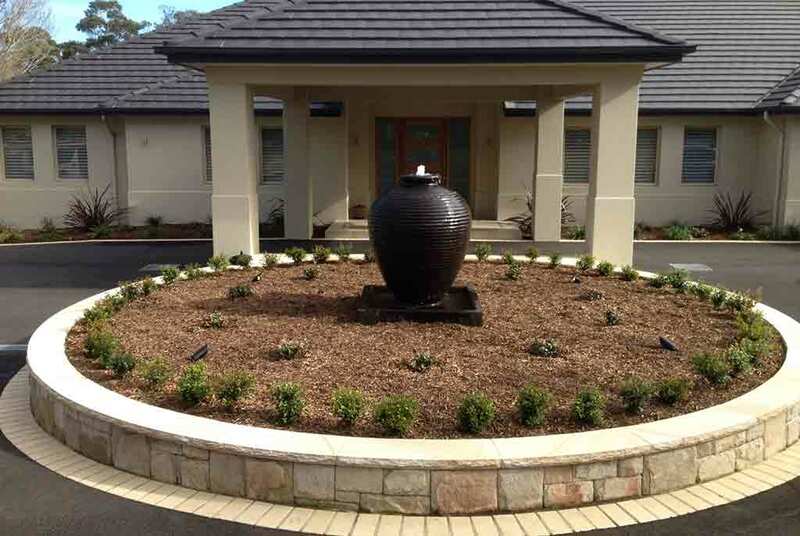 A large stone front fence with in-built letterbox and a huge round-about with in-built water feature for the bitumen driveway are just some of the features of this Dural NSW project. Light colour pavers were used to create a contrasting border around the garden beds featuring native plants. 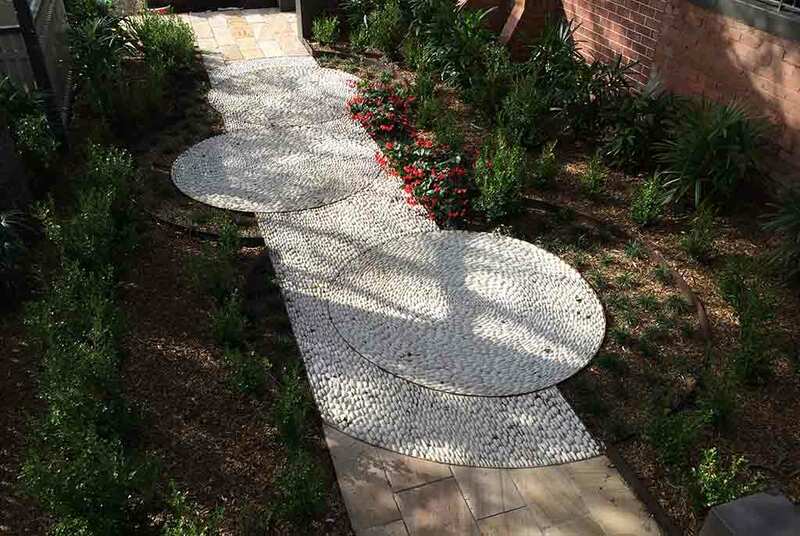 We used close to 23 000 white polished pebbles to create this magnificent pathway. Laid by our talented team of professional over a five day period. Designed by Nicholas Bray, the path simulates the waves of the ocean which is exactly what our client was after given their close proximity to the beach. Our client coming from the lovely Sydney suburb of Rozelle wanted to turn their small backyard space into a relaxing entertaining area for friends and family. 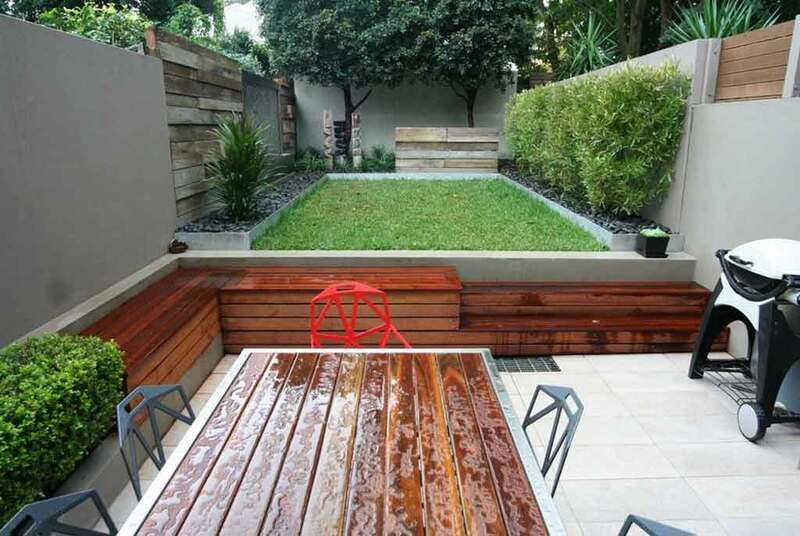 We were able to transform the small, cramped space, into a vibrant, open backyard with features such as tiling, water feature, lawn and recycled timbers. Nothing is too difficult for the team at Sand & Stone Landscapes. The above portfolio is just some examples of the work we have completed and if you are looking for something specific please reach out to us as we have more project examples on hand which we can share with you. 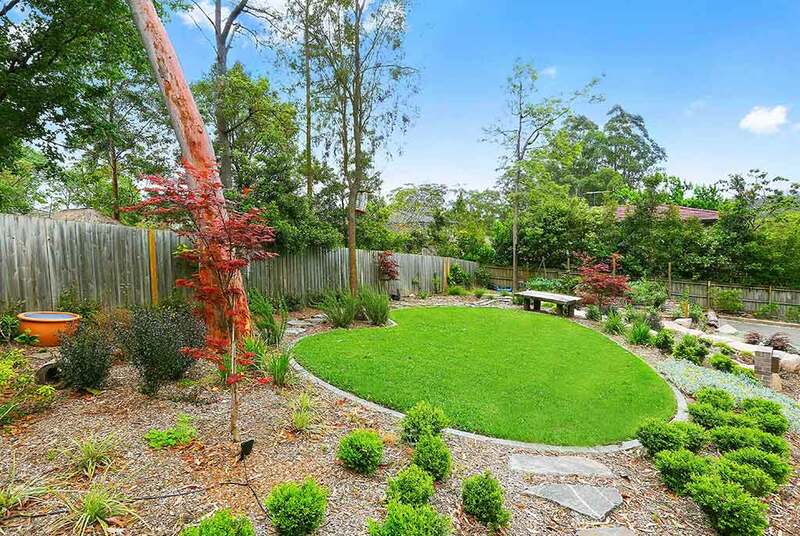 We are your Sydney based landscaping team, dedicated to providing outstanding customer service and quality work. If you want to know more about any of the items in our portfolio please contact us today.